I am concerned that the next wave of "putting a finger in the dike of the housing crisis" cures will be built around risky loans created solely to help you refinance a home. In response to yesterday's Weekly Special Report "The Great Falling Home Supply Mirage," several readers were quick to comment on thoughts they have concerning the next ignorant solution being thrown at the housing crisis. One reader noted that many of the large lenders plan on unveiling a program in March that will allow homeowners to refinance a home for up to 125% of its value. 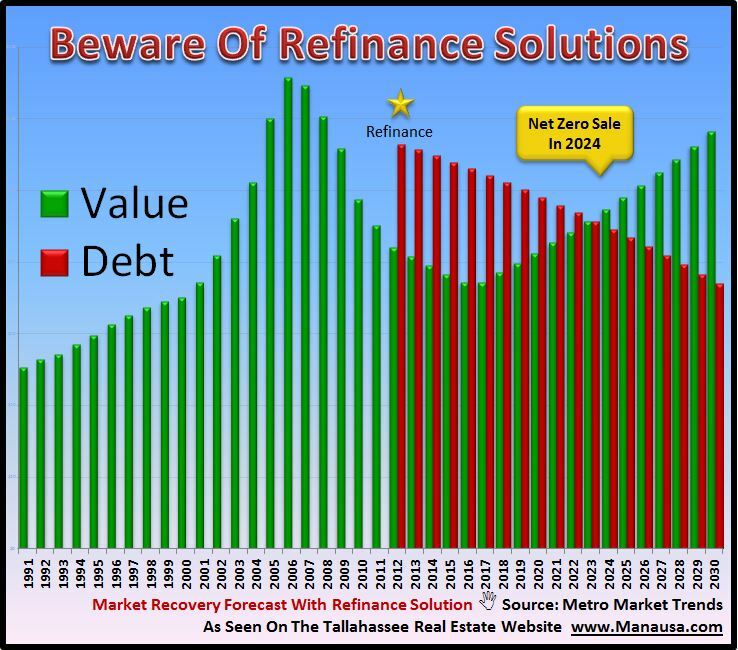 Unfortunately, the numbers say that we are too far down the road for a solution to refinance a home to help most homeowners. At face value, it sounds like a smart compromise from the banks. However, I believe this is another poorly contemplated solution that will only slow down recovery time in the housing market. A wise brother of mine once warned "Joe, you cannot refinance your way out of debt." I will now pass his sage advice on to our readers. If home values proceed as we have anticipated in our Housing Market Recovery Analysis, then a homeowner who refinances a home today at 125% of its current value will most likely be able to sell in 2024 without having to bring money to closing. Yep, 12 more years. This is assuming that they can get the loan today. So many homeowners in Tallahassee already owe more than 125% of what their home is worth, so this solution would not work well for them. So think about it. If you want to be in your home for 12 or more years, this might be smart for you. But if you know you want to sell your home much sooner than that, then I don't think this is a solution. I think it is a band aid, another proverbial finger in the dike that is designed to keep bank leadership in their current jobs. False hope only slows the inevitable, just as we saw with the Homebuyer Tax Credit. It pulled some "future buyers" into the market, but now that it is behind us, the market has returned to where it was. How much did the government invest in a program we all knew would fail? A solution that involves refinancing homes at values greater than the market will bear stinks. This traps people in their homes even longer, and it will slow down the recovery of the housing market. The majority of people who own homes move far more often than every 12 years, let alone the average 20 years that this program would require (bulk of upside-down homeowners purchased their home 7 to 10 years ago, thus a 12 year solution leaves them in their homes for more than 20 years). 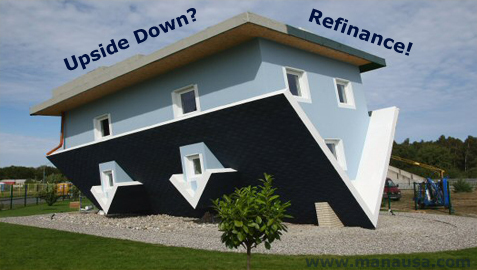 Want To Refinance A Home? If you really think that you are in your home for the long-run, then I would contact Robert Barnette at Hancock Bank and get his opinion about whether or not you will qualify to refinance a home. Simply put the information in the form above, and Robert will be notified immediately about your desire to refinance a home.